Cramming for a state capital quiz tomorrow? Need a fresh way to remember all those names? Take our quiz full of historical and fun facts about each and every state capital and see if you don’t end up acing that test! Try it now! Test yourself on the fifty state capitals. Yep, they’re all here in one big quiz. Montgomery is the capital city of Alabama. It became the capital in 1846 and is the second largest city in the state (after Mobile). An important city during the civil rights movement, where bus boycotts and marches took place, it is also the birthplace of Nat King Cole. 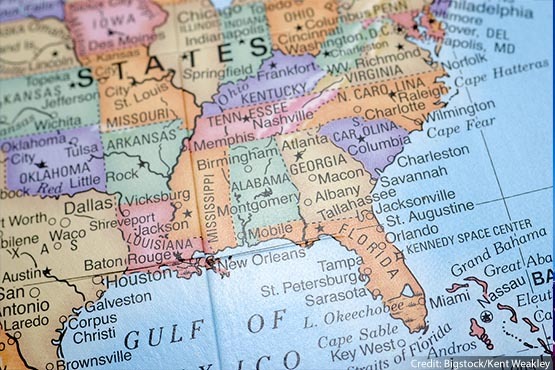 Which city is the capital of the largest (geographically) state in the U.S.? Juneau is the capital of Alaska and has been since 1906, long before Alaska became a state in 1959. This state capital gets an average of 93 inches of snow each year! Phoenix is the capital of what state? Phoenix is the capital of Arizona. It is the fifth most populous city in the United States, and the temperature has been known to hit 120 degrees (F) in the summer. Little Rock, named for a landmark in the middle of the Arkansas river, become the capital in 1836 at the same time Arkansas became a state. Which city is the capital of the Golden State? Sacramento is the capital city of California. It replaced Monterey as the permanent state capital in 1879. Despite the designation as the capital, the last governor of the state to live there full-time was Ronald Reagan in 1967. This state capital is known as the Mile-high city. Denver, the capital of Colorado, actually is located one mile (5,280 feet) above sea level. Hartford, CT, in addition to being a state capital, is also known as the Insurance Capital of the World becasuse of the many insurance companies based there. Dover became the capital of Delaware in 1777. The city was an important stop on the Underground Railroad during the Civil War because of its location between slaveholding Maryland and free Pennsylvania and New Jersey. This state capital is named for a Muskogean Indian word often translated as old fields. Tallahassee, FL is named for land Creek Indians discovered when they migrated to the region during the 18th and 19th centuries. When they arrived, this discovered it had been farmed extensively in the past, hence the name, old fields. This state capital is also the headquarters for many corporations, including Coca-Cola, CNN and Delta Airlines. Atlanta, GA, is the home to all those companies. General Sherman burnt the city to the ground (with the exception of churches and hospitals) preceding his march south at the end of the Civil War, and it became the capital in 1868 as the city was rebuilt during the course of reconstruction. This state capital is located on the island of Oahu. Honolulu, which means place of shelter in Hawaiian, is the capital of Hawaii. In addition to being the birthplace of President Barack Obama, the city hosts Japanese, Filipino, Australian, South Korean, Micronesian and Marshall Island Consulates. Boise is the capital city of Idaho and has been since 1865. Its name is derived from the French word Bois, meaning Wood because of the many trees in the area. Did you know Oprah doesnt actually live in the capital city of Illinois? What IS the capital of Illinois? Springfield, IL, isnt the home of The Simpsons, either, but it did become the state capital in 1839. A famous person who actually DID live in Springfield? Abraham Lincoln, who resided there from 1837 until he became President in 1861. This state capital hosts an annual sports event called the _____ 500. Name the city. While the race doesnt actually take place inside the city of Indianapolis, Indiana (it actually happens in nearby Speedway, IN), the city is the state capital and does lend its name to the race, which takes place over Memorial Day weekend each year. The winner of the race drinks a bottle of milk, after a tradition started by winner Louis Meyer in 1933. Since 1972, this state capital has been an important base for Presidential campaigns because the first electoral event takes place here. Des Moines became the capital of Iowa in 1857, shortly after its original name, Ft. Des Moines, was shortened. The name Des Moines is taken from one of two rivers the city sits on the banks of, the other called Racoon. The name of the capital city of Kansas comes from the Native American langages Kansa and Ioway and means to dig good potatoes. Topeka, KS, was founded during the 1840s as a river crossing in the middle of what was to become the Oregon Trail. It became the capital in 1861 when the Kansas Territory was admitted to the Union. Frankfort, KY, was founded in 1775 in what was then still Virginia. Because it was one of the wealthiest and most educated cities in early America, it was given the nickname: The Athens of the West. Which state capital gets its name from a French phrase meaning red stick? Baton Rouge became the capital of Louisiana in 1849. The city has a rich cultural history, and has been influenced by the French, Spanish, British and Acadians (Cajuns), who moved to the area from Canada in the 18th century. This state capital is also the Easternmost capital in the U.S.
Augusta, ME, became the state capital of Maine in 1827, shortly after Maine became a state in 1820. This state capital is also home to the United States Naval Academy. Annapolis, MD, was once briefly the capital of the United States in 1783 and 1784, but it was the capital of Maryland long before that, begining in 1694. The USNA was founded there in 1845. Boston, MA is the largest city in Massachusetts and the state capital. Founded in 1630, this historical city is home to the nations first public school and has since become known as a host to academia — there are more than 50 colleges and universities there, including Harvard. This state capital was once home to the oldest car manufacturing plant in the country. Lansing, MI, became a state capital in 1847, after its citizens decided they needed a more centralized capital further away from the British who were then in control of Canada. Because no one could choose between the larger cities in the state, what was then tiny Lansing was chosen as a compromise. As for that auto plant? It closed in 2006. This state capital has a twin sister city, and theyre located a few miles apart along the Mississippi river from each other. St. Paul, Minnesota became the state capital in 1849, when Minessota became a territory. The city had been an important trading ground since the Louisiana purchase in 1803, because of its positioning near the source of the Mississippi river. This state capital of Mississippi is named for the seventh President of the United States. Jackson, MS, became the capital in 1821. The city was an important manufacturing center for the south during the Civil War and it was eventually captured by the Union after a weeklong seige of the city in 1863. The capital of the Show Me state is Jefferson City. It became the capital in 1821 and was nearly named Missouriopolis before the founders changed their minds. The state capital of Montana is named for the hometown of one of its founders. Helena, Montana became the capital of The Big Sky State in 1889, when the territory became a state. It was named after St. Helena, MN, and was shortened to suite the preferences of the gold miners who named it. Lincoln, Nebraska, or Star City, became the capital in 1867, after being renamed (it was once called Lancaster) for the recently assasinated President Lincoln. Viva, Las Vegas! Contrary to its popularity as a vacation destination, Vegas is NOT the capital of Nevada. What is? Carson city, NV, became the state capital in 1864, when Nevada became a state. Like other cities in Nevada, it sprung up because of the many gold miners flocking to the area. Live Free or Die is the state motto of New Hampshire. What is the state capital? Concord, NH became the state capital in 1808. The capital building there has the distinction of being the oldest State House (built in 1819) in which legislative branches still meet in their original chambers. What city is the capital of the Garden State? Trenton, NJ, became the state capital way back in 1790. The city was, for a short time in November and December of 1784, the capital city of the United States as well, and George Washington won the first battle of the Revolutionary war there. Which city is the oldest state capital in the United States? George Washington called this state The Empire State and it stuck. What is its capital? Albany, NY became the state capital in 1797. It is the oldest surviving European settlement from the original thirteen colonies, and is located along the Hudson River, which made it a center for trade throughout its history. Which state capital is named after one of the sponsors of the lost colony of Roanoke? Raleigh, NC, became the state capital in 1792 and was named for Sir Walter Raleigh, a sponsor of the lost colony of Roanoke. Together with Durham and Chapel Hill, these three cities make up what is known as the Research Triangle because of the many University and Corporate research facilities with their headquarters in the area. What is the state capital of the North Dakota? Bismark, ND, became the state capital in 1872 and kept its status when North Dakota became a state in 1889. Their capital building, a 19-story tower, is the tallest building in the state. What capital city in named for a 15th century explorer who has been credited with the discovery of the Americas? Columbus, OH, which became the state capital in 1816 (Ohio became a state in 1803) and was named for the explorer Christopher Columbus. Which capital city name translates as Land of the Red Man in Choctaw? Oklahoma City, OK, became the capital of the state in 1907. The largest state capital in terms of land area, the city is also located on what is essentially an oil field, and there are oil derricks located on the grounds of the state capital building. Which Northwestern states capital shares a name with a witchy Northeastern town? Salem, OR, became the capital in 1859, at the same time Oregon became a state. The word Salem is derived from Arabic and Hebrew and means peace. Harrisburg, PA, became the state capital in 1812. The city, which has had the same mayor since 1981, was once a stop on the Underground Railroad. Which state capital was founded by Roger Williams, after he was exiled from the Massachusetts Bay Colony because of his religious beliefs? Providence, RI, was founded in 1636 and only became the state capital in 1900. Williams originally named the settlement he founded Providence Plantation because he felt that he had divine guidance in settling in that particular spot. This state capital, located on a fall line in the Appalachian Mountains, was nearly named Washington. Columbia, SC, became the state capital in 1786 and was an important part of South Carolina commerce from its founding because of its location in the center of the state, and at the point where two rivers meet. This state capital was named for a French-Canadian Fur Trader. Pierre, SD, became the state capital in 1889, when South Dakota became a state. This state capital has the nickname music city because of the country music industry that its home to. Nashville, TN, became the state capital in 1843. The city is home to dozens of record labels and the music industry there is second only to New York as the countrys largest center for music production. This state capital was orginally known as Waterloo. What its called now? Austin, TX, became the capital city in 1845. Its name was changed from Waterloo to honor Stephen F. Austin, The Father of Texas. This state capital is also home to the headquarters of the Mormon church. Salt Lake City became the capital of Utah in 1858, when Utah was still a territory. It was founded in 1847 by Brigham Young and a group of Mormons who had been exiled from their homes further east because of their religion. This state capitals claims the smallest population of any capital in the country. Montpelier, VT, has a population of just over 8,000 people (as of the 2000 census) and became the state capital in 1805. This state capital was originally settled by a group of English settlers from Jamestown around 1610. Richmond, VA, became the capital in 1780. The original settlement had been abandoned in the mid-1600s, but was built up again in the 1730s, in plenty of time for Patrick Henry to delivery his Give me liberty or give me death speech there in 1775, made in an effort to rally the colonies against British rule. This state capital was named for the scenic mountain range you can see on its northwest side. Olympia, WA, became the state capital in 1889, when Washington became a state. It is located at the southern end of Puget Sound, and the Olympic mountains are visible to the northwest. Charleston, WV, became the state capital in 1877 following West Virginias break from Virginia during the Civil War. This state capital is named for the fourth President of the United States. Madison, WI, became the capital in 1836 and is named for James Madison, who had died earlier that year. In another patriotic hanomage, my of the streets in Madison are named for the 39 signers of the Constitution. This state capital was founded by surveyors establishing a track for the Union Pacific Railroad. Cheyenne, WY became the state capital in 1868 when Wyoming became a territory of the United States. Because the railroad the founders in question sprung up quickly, rapidly bringing a population of nearly 4,000 like magic, the city has been known as Magic City.